Feel on top of your game with this fine wrap sweater. 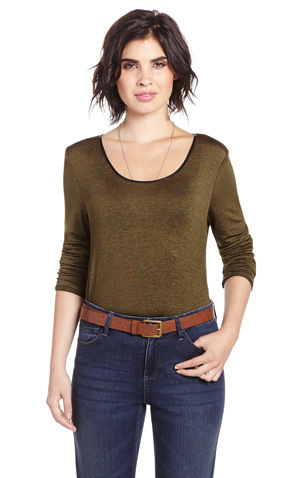 This long sleeves sweater features ribbed cuffs and hem, and you'll simply love it! Layer it over a tonal cami or a different colour for a contrasting look. I bought the purple one, the colour is very nice. It's comfortable. Good quality and fits perfectly. Love this sweater. Such a great springy green color. It gives me a perk after all the winter blahs. The crossover is figure flattering also for a "mom tummy". Beautiful sweater. You may need to go up a size. Not clear that there's a camisole underneath. Need to factor into purchase. I really like the look of this top but the fit could have been better. The sleeves are very tight fighting so I had to size up to a medium when I usually take an XS or Small. The body is a little baggy than I would have liked having to size up but all in all it looks very nice. I love the verstility of it, as it can be worn with jeans or dress pants. This sweater can be used with different camasoles to wear with a variety of different colour pants or skirts. These sweaters are amazing. They are so soft and wash beautifully!